Crafts and Cravings: My First Post for Riley and Company! Good morning to everyone! I am just super excited to have my first post for this amazing stamp company today! Riley and Company and Funnybones have some extremely cute stamps and hilarious sentiments! When you are through reading my post, make sure you head on over HERE to shop! On the Riley and Company blog today we are having a challenge. It is a sporting challenge. The first public basketball game was played on March 11, 1892. In honor of that please create a card with a sporting theme! 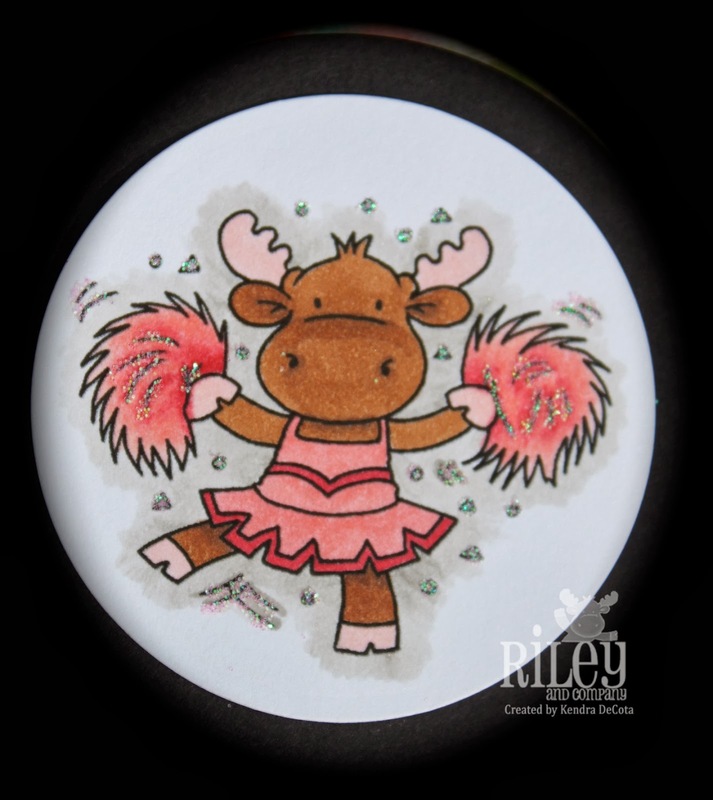 Remember to use a Riley image and link it up on the BLOG. For my card I have used Cheerleader Sophie. Isn't she a cutie?! I colored her with my new pink copics! Yes, I celebrated the new DT spot with a splurge on copics! For her dress and pom-poms I used R32, R37, and R30. For her body I used E35 and E47. For the antlers I used R30 again, and W1 to go around the whole image. The pink paper is from a random company, and I'm not even sure which one! It was in my stash. The glitter paper was made for me by my daughter, because playing with glitter is fun! Thank you honey! The patterned paper is from Basic Grey in the Raspberry stack, and the pearls are from my stash. Make sure you head on over to the Riley and Company blog and play along in our challenge, and don't forget to do some shopping! Kendra--such a cute and girly Sophie card. I'm looking forward to working on the Riley team with you! i am a bit of a riley fan.....and this image is adorable! cute cute card, welcome to the team! This is such a cute card. Love your design and the strip of handmade glittered paper is perfect choice. So glad you joined us for the Sparkle N Sprinkle Creative Challenge. Pretty in pink! Great coloring too. Thanks for playing along with us this with in the Anything Goes (with pearls) over at the Simon Says Stamp Wednesday Challenge Blog! A very pretty card Kandra, thanks for sharing with us at Stamping Sensations challenge. This is so cute!! Thanks for joining our pink challenge at Stamping Sensations. What a fun card and I love the design. What a pretty pink creation! Thanks for joining us at stamping sensations this month and good luck! Great card, love the pink reindeer such a cutie. I just love the colors in this card! The pink background and patterned paper are perfect together!